Last night was the Microbiology of the Built Environment session at the bi-annual Lake Arrowhead meeting. 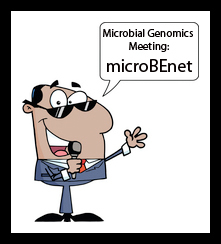 This session was organized and sponsored by microBEnet. I recorded some of the talks and will post those videos here after some editing. Here’s a summary of the speakers and the topics discussed. The first speaker was James Meadow from the BioBE Center. He gave a talk entitled “Architectural Influences on the Built Environment Microbiome”. This was an overview of some of the projects going on at the BioBE Center including their hospital ventilation study, work on dust/air samples collected around campus, and their work on classroom microbiomes. For some more information search microBEnet for “BioBE Center” or check out their website. The second speaker was Jason Stajich from UC Riverside and a member of the MoBEDAC project. His slides for his talk “Fungi in the Built Environment” can be found here. Since Jason was the only speaker at this entire conference talking about fungi he gave a good intro into why fungi are cool. He also talked about the 1000 Fungal genomes project, the FungiDB, fungal taxonomy, and the ITS barcoding scheme. Next up was Laura Sauder from the University of Waterloo who gave a talk entitled “Exploring Archaeal Ecology and Abundance in Built Freshwater Environments”. She talked about the discovery that archaea, particularly thaumarchaeota, play an important role in nitrogen cycling in built environments such as aquaria and wastewater treatment plants. Also worth noting that microBEnet will be collaborating with this group (Josh Neufeld) on an undergrad research project in aquariums over the next year. Our fourth speaker was Tara Schwartz from UC San Diego who was replacing her PI (Scott Kelley) at the last minute. Her talk was entitled “Viral and Bacterial Communities in Public Restrooms”. This work grew out of work produced by another Sloan funded lab on the “Microbial Biogeography of Public Restroom Surfaces”. Tara talked about studying fewer sites in more detail, particularly in trying to catch the viruses as well as the bacteria and archaea. The last speaker of this section was Susanna Remold from the University of Louisville. She talked about “Pseudomonas as a Model for Studies of Microbes in the Home”. Her group went into homes and sampled a huge number of sites (150/house, 12,000 in total). Unlike many of the projects we’ve blogged about, they are actually culturing strains from their samples and comparing the phenotypes. They then hope to move into “genomics informed by culture-based studies”. Good talks and a very informative session overall. Removing the Storify and Embedding a Wakelet since Storify is gone.